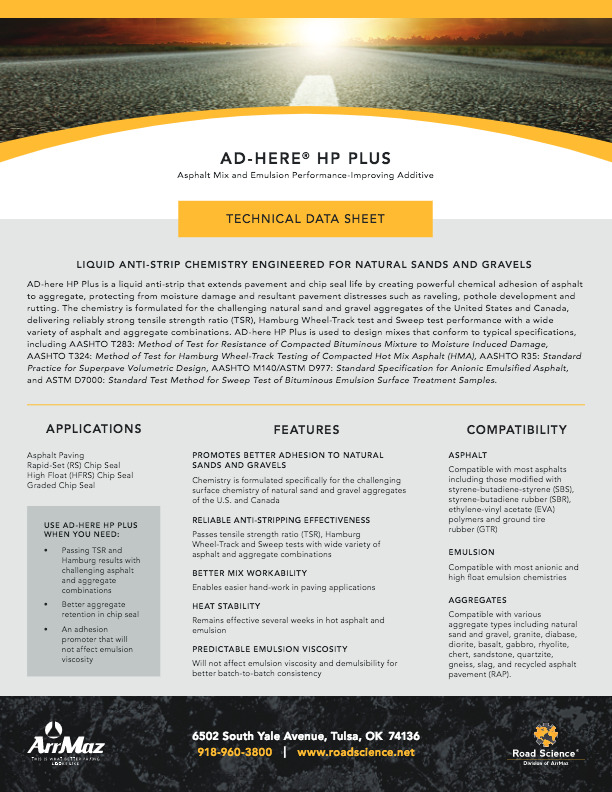 Liquid anti-stripping asphalt additives or adhesion promoters are chemicals added to asphalt to improve aggregate coating and increase the strength and frequency of chemical bonding between asphalt and aggregate. 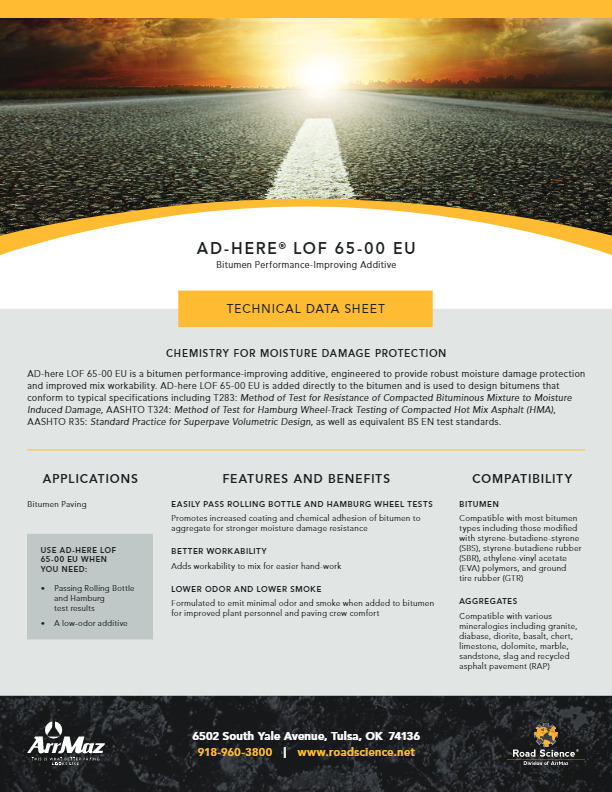 The increased bonding strength provides pavements with defense against moisture damage destruction, when asphalt detaches from aggregate in the presence of water. 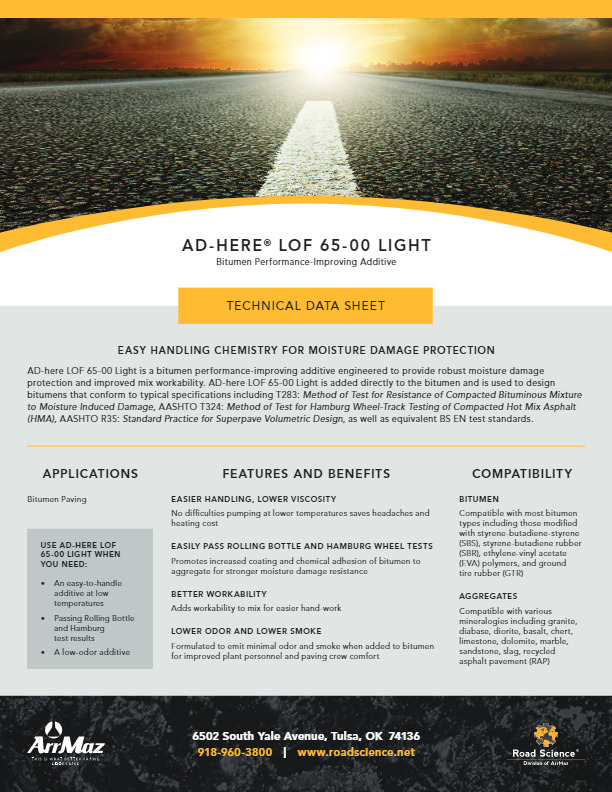 Moisture damage, if not guarded against, causes rutting, potholes and ultimately pavements to fail prematurely. 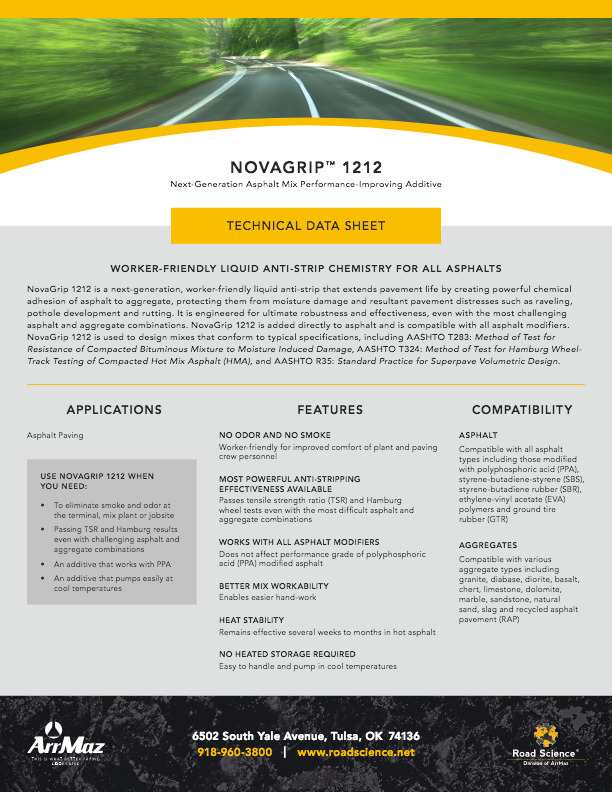 Liquid anti-strip additives are added in small amounts to asphalt, usually around 0.25 – 0.50% by weight. They have easy handling characteristics and can be added to asphalt in a number of convenient ways by either the asphalt terminal or the hot mix producer. 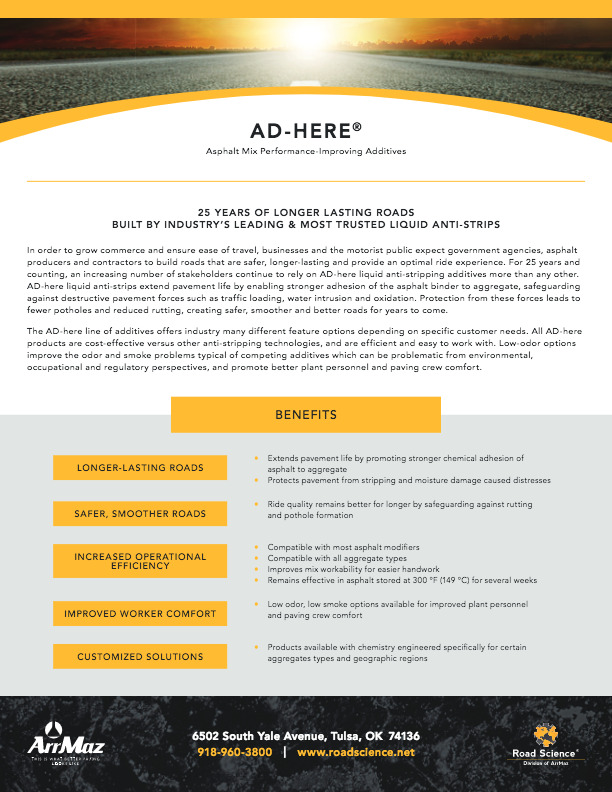 Liquid anti-strips benefit agencies, commerce and the motorist public by helping to ensure pavements meet design life durations, experience less frequent repairs causing fewer motorist user delays, and provide improved safety and ride experience. 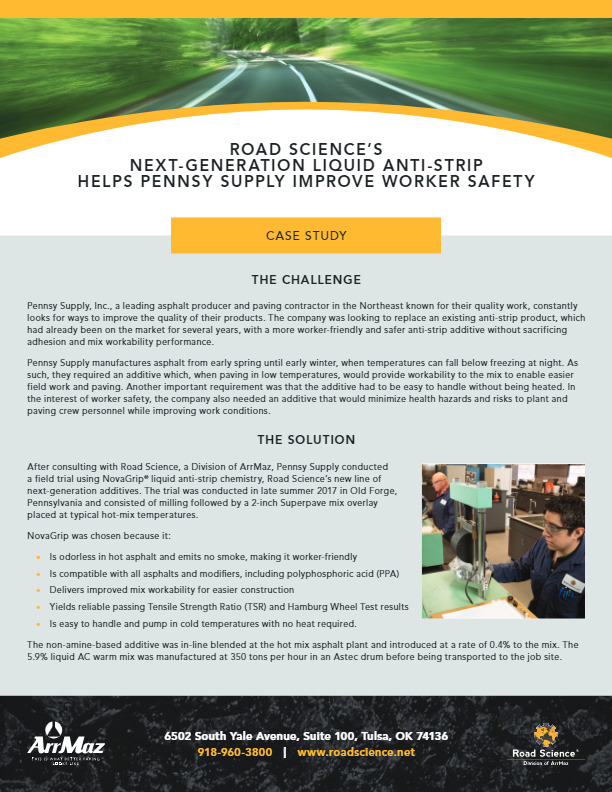 Road Science has been the North American leader in liquid anti-strip manufacturing and innovation for the past several decades. 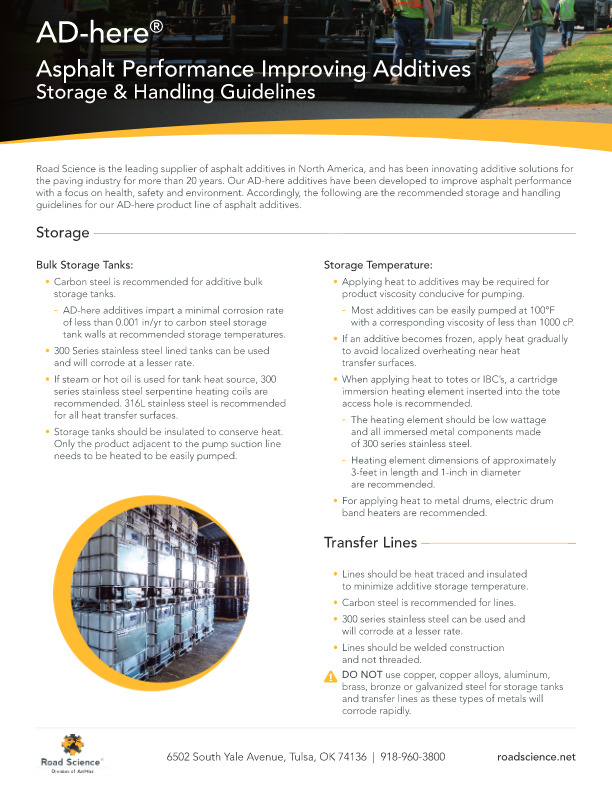 Our portfolio includes three distinct product lines, each with specific product features and advantages. 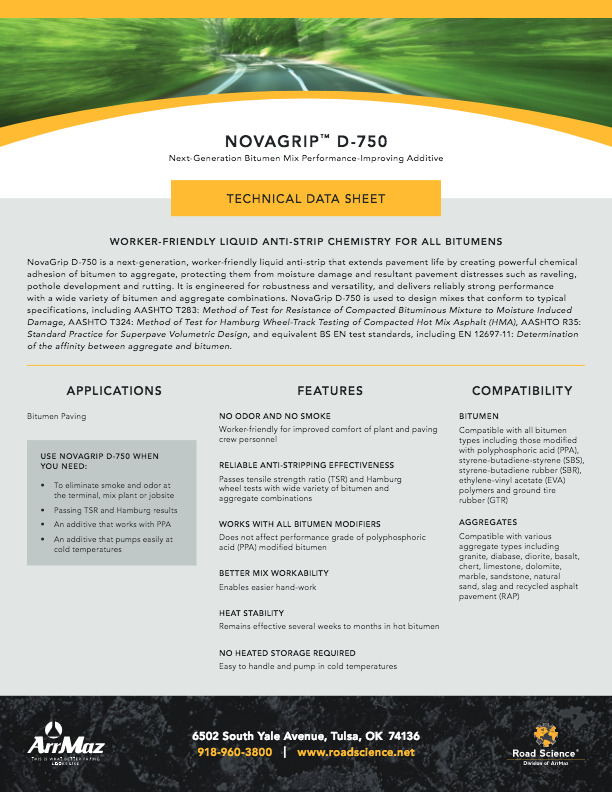 With today’s rapidly aging infrastructure, government agencies, asphalt producers and contractors are being challenged to build longer-lasting roads with technologies that not only perform well, but are also cost-effective and operationally efficient, while ensuring worker comfort and safety. Road Science’s NovaGrip line of next-generation liquid anti-stripping asphalt additives fully addresses today’s challenges. 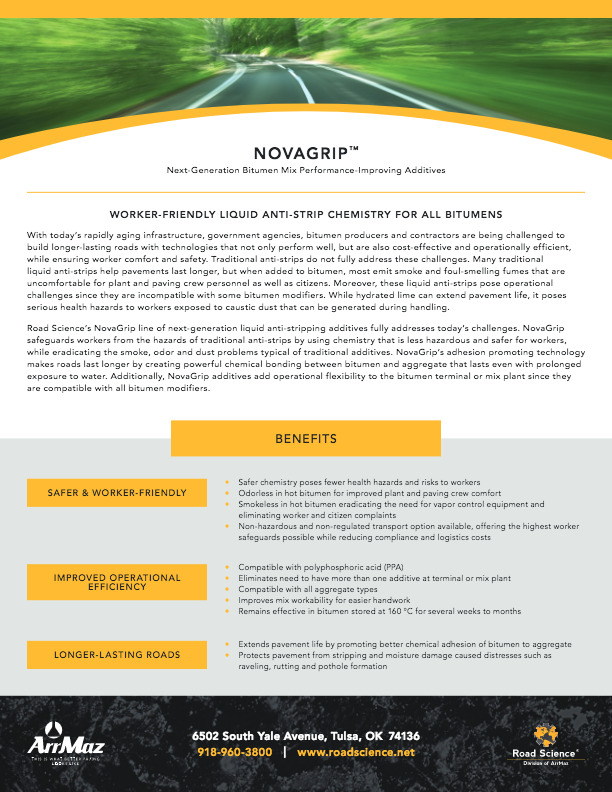 NovaGrip safeguards workers from the hazards of traditional anti-strips by using chemistry that is less hazardous and safer for workers, and also eradicates the smoke, odor and dust problems typical of traditional additives. 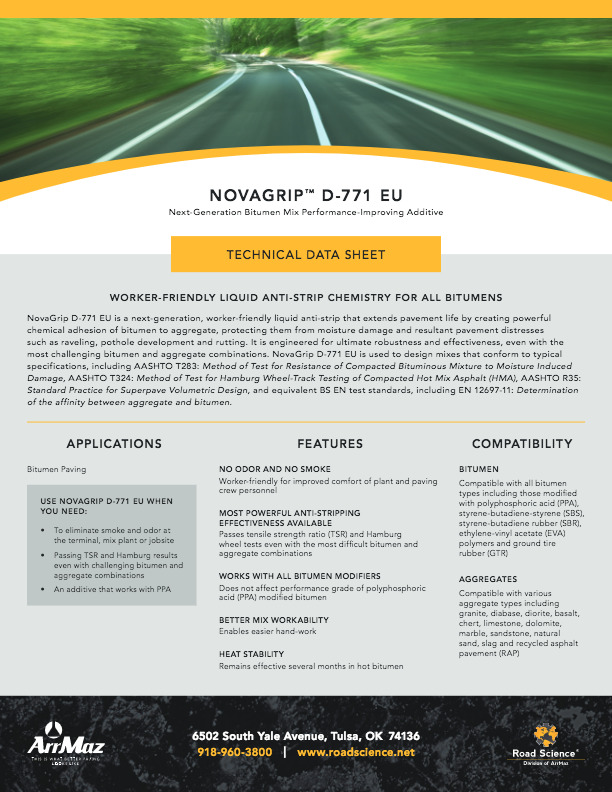 NovaGrip’s adhesion promoting technology makes roads last longer by creating powerful chemical bonding between asphalt and aggregate that lasts even with prolonged exposure to water. NovaGrip additives add operational flexibility to the asphalt terminal or mix plant since they are compatible with all asphalt modifiers, and do not interact with other asphalt and mix components to adversely affect asphalt properties or grading. 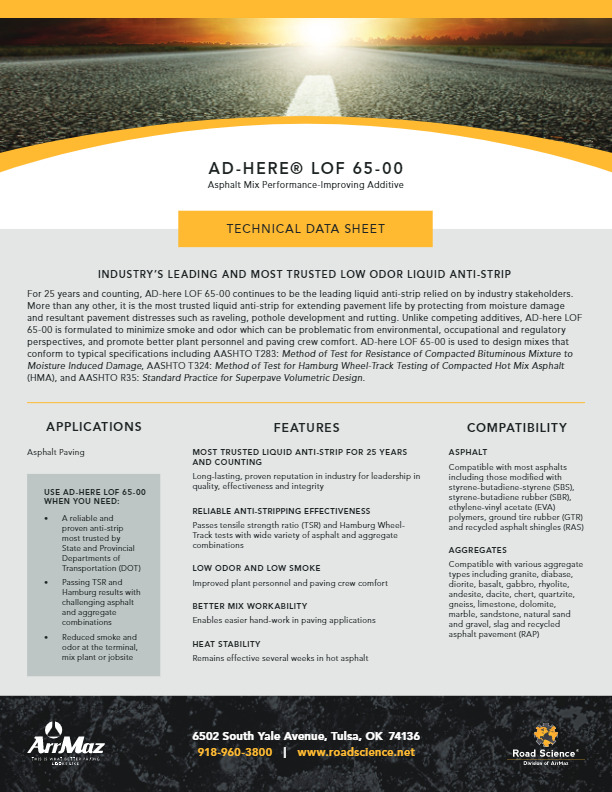 For more than 25 years and counting, agencies, producers and contractors continue to rely on AD-here liquid anti-strip additives more than any other. The AD-here line of products offers industry the widest variety of feature options, depending on specific customer needs. 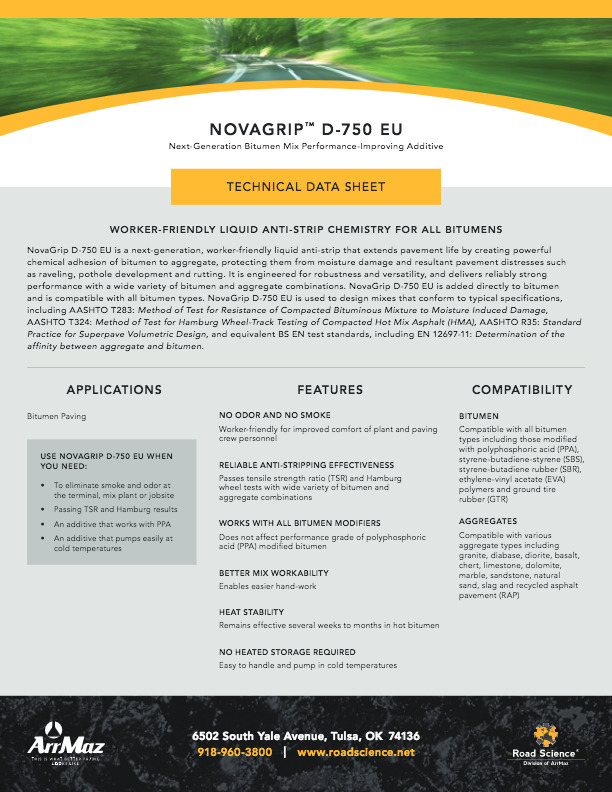 All products are cost-effective versus other anti-stripping technologies and are efficient and easy to work with. Low odor options improve the odor and smoke problems typical of competing additives that can be problematic from environmental, occupational and regulatory perspectives. 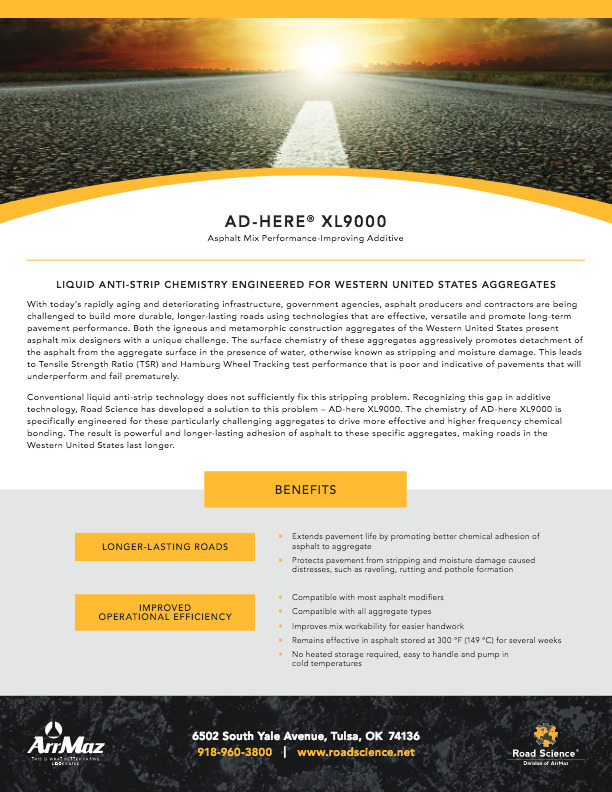 In a difficult environment of rapidly aging infrastructure and dwindling highway funding government agencies, asphalt producers and contractors are being challenged to build longer-lasting roads at the absolute lowest cost. 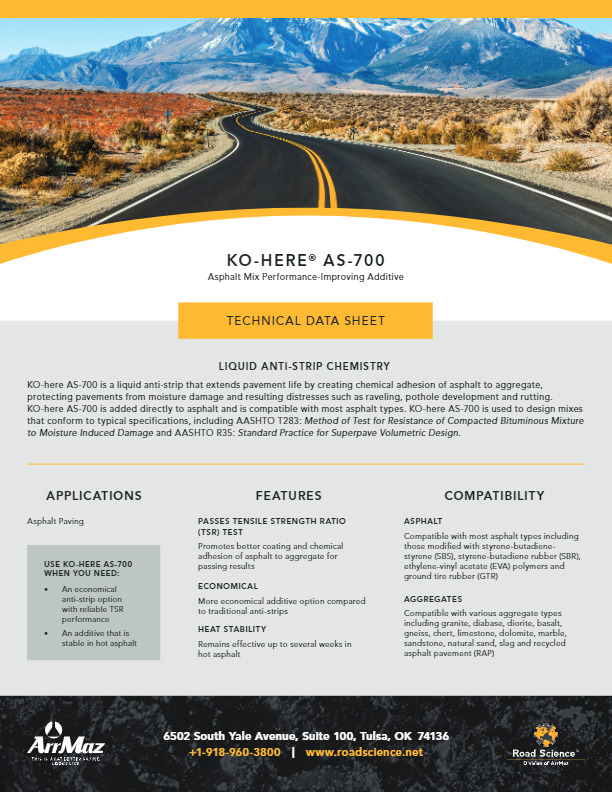 Road Science’s KO-here line of liquid anti-strip additives address today’s challenges to build longer-lasting roads while minimizing costs. 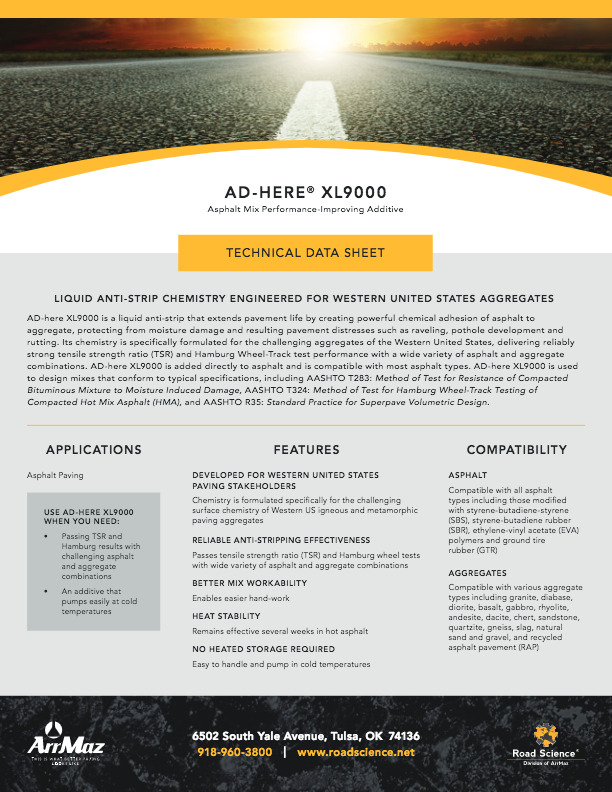 KO-here’s adhesion promoting technology is based on specialized chemistries that most economically prolong pavement life. 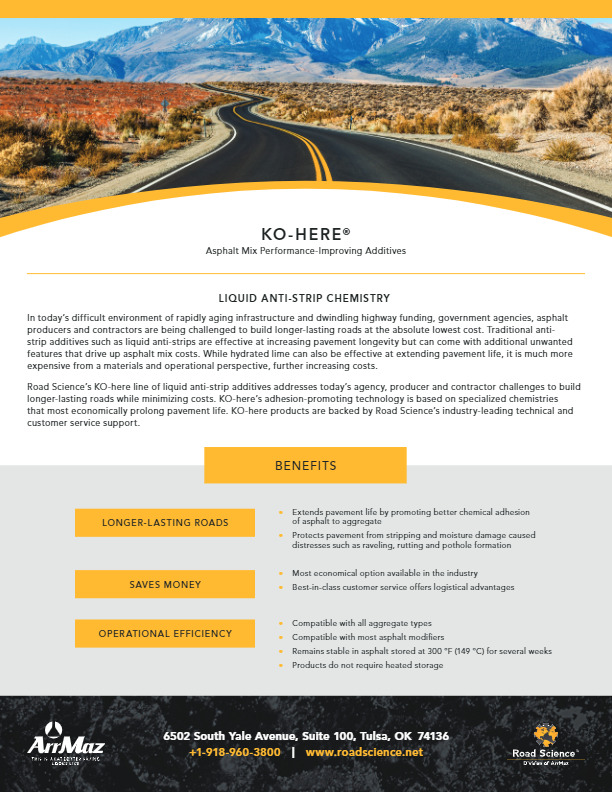 KO-here products are backed by Road Science’s industry-leading technical and customer service support.